Looking to heat things up before summer hits? Plant different varieties of peppers in March! Do you have a garden? If not, are you interested in starting one? Picking up gardening as a hobby is a great way to enjoy the outdoors in a new light – and reap the rewards! Not every seed you plant this early in the season is going to grow successfully. In fact, there are very specific ideal times to plant certain foods in your garden for optimal growth. Atlantic Maintenance Group is here to fill you in on the best vegetables to plant in March, so you can start gardening today! Need help with your spring landscaping? You can call us for that too. Spinach: Packed with vitamins, fiber and protein – this cool weather vegetable is perfect to plant in March! It will grow the fastest in well-drained soil rich in organic matter like compost. Cabbage: Simple growth! Be sure to choose a variety that suits the space you have available in your garden, and don’t forget to fertilize and water when you notice the cabbage head forming. Corn: If you haven’t got a lot of space, start with a small stalk. Corn grows super fast and can be enjoyed just moments after being pulled off the stalk. Onions: If you love to cook with onions, they are a wise and resourceful choice to include in your garden. Be sure to select an onion variety that suits your garden space and region. 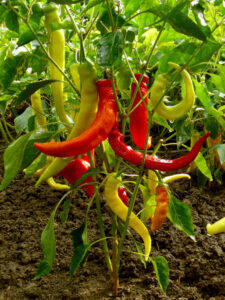 Peppers: Similarly, if you enjoy eating peppers they are a rewarding vegetable to plant in March. They require little space to plant and tend to yield even better results when planted in close quarters with other pepper varieties. This entry was posted on Thursday, March 10th, 2016	at 11:18 pm	and is filed under Blog, Landscaping Maintenance	. You can follow any responses to this entry through the RSS 2.0	feed. Both comments and pings are currently closed.